His summary hits the nail on the head. Isn’t that how most control systems seem nowadays? Adding new functionality to a system means the plant needs to buy a new piece of software, or pay for more tags for the existing software. Increasing the number of people who can access data means paying for more clients. Systems become patched up with a host of software pieces that do this and that, but fail to work together well. And don’t even mention operating system updates—those are just nightmares waiting to happen. The industry has been stuck in this cycle far too long. But if you talk to any of Connell Industries’ clients, they’re happily working without these headaches. Everyone has access to the system. They’re growing their systems. And they have more plans on the horizon. Customers are finding a new way of thinking about their control systems because Connell Industries can deliver what most other integrators are not: web-based freedom, unlimited scalability, and unrivaled technical support. When presenting a solution to potential customers, DiGangi and his control engineers will conduct a small demonstration in front of the customer. The web-based aspect of the software is usually understood best if demonstrated to a customer right in their office. Users can access information anywhere by web-launching project screens, such as this screenshot. Clicking on different areas of the plant blueprint will display information for that section of the system. 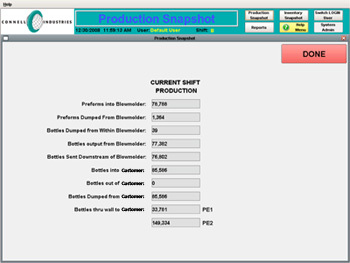 Above, preform and bottle counts are displayed in real-time to the user. 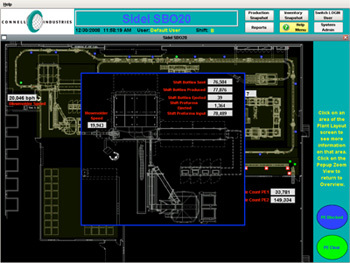 Connell Industries set up the Inductive Automation software to generate reports, which can then be used to document the number of bottles produced and when they were delivered to the customer. One of the top reasons DiGangi gave for choosing Inductive Automation was the fact that licensing is very user friendly. Customers pay once and don’t worry about paying for extra tags and clients down the road when they want to add on to the system. The software is placed on one server—or on any computer, which can act as a server—and is accessible from any other computer connected to it on their network. Once set up, the system is extremely agile and new projects can be built at the server level and web-launched to any network client. “Licensing issues are non-existent and there is great flexibility to ‘grow’ the application as the customer’s demands evolve and become more elaborate once they see the benefits of the system,” DiGangi said. One example of how flexible the system is and how licensing opens up new possibilities for DiGangi’s customers, is their recent project with Graham Packaging. Graham Packaging manufactures bottles for their customers. They were facing a costly issue from a discrepancy between how many bottles were made, and how many the customer said they actually received. The customer reported that they either didn’t receive the correct number of bottles or that they didn’t receive the bottles by a certain deadline. As a result, Graham Packaging was being back-charged for loss of product, sometimes as many as 60,000 bottles. The bill for one month of claims for undelivered product can be very significant. They asked Connell Industries to engineer a solution for tracking the preforms (the first stage of material for producing beverage bottles) and generating reports to back up the quantity of bottles that they made and when they delivered them. DiGangi explained that while Graham Packaging originally wanted to track just the preforms, it turned out that there was more to it than that. Oftentimes it’s about solving the problem behind the problem. The original requirement was to track the preforms, but it became apparant that it would be more beneficial to also track the equipment downtime—where underlying causes might be caught and easily addressed. 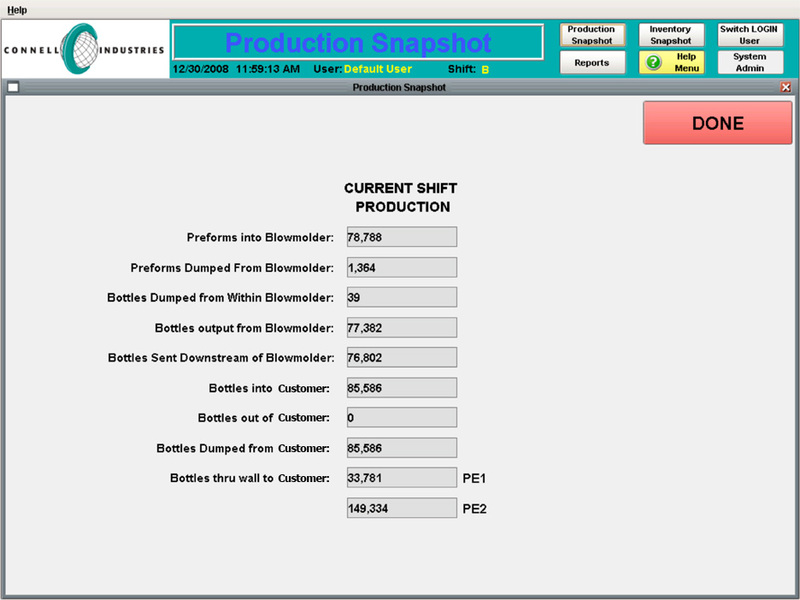 The end result was a production counting and preform / bottle inventory tracking system with built-in production line downtime monitoring. This type of creative solution was only possible because of the licensing structure for Inductive Automation software, DiGangi noted. The software is licensed by the server and each server license includes unlimited tags and clients. This gave DiGangi’s company the freedom to take the project to a deeper level, and deliver a better solution to Graham Packaging. Vincent DiGangi joined us on a webinar to demonstrate his solution on Aug. 19, 2010. Click here to watch the recorded version of the webinar. Connell Industries, Inc. is a mid-sized control system integration company based in New Jersey. The company has been in business for over 15 years, providing control engineering and manufacturing equipment services to a large number of plastic packaging, power generation utilities, and food and beverage customers.